Many argue that illegal immigrants come to the United States and take jobs away from Americans, but here not only are there no non-Latino workers, the labor contractor says not one has ever applied for this job... until today. CNN Correspondent Gary Tuchman was among the workers today ready to put in a shift picking grapes that are then boxed and delivered to local grocery stores. Photojournalist Kevin Myers and I are with him to capture Gary's day in the vines. We called the United Farm Workers representatives to ask if Gary could spend a day working here and they agreed. When we arrive, we immediately notice we are unprepared. People are wearing long sleeve shirts and have their faces covered with various scarves and long brimmed hats. We showed up in t-shirts and jeans. They tell us they wear the clothing to protect themselves from the heat and cover their mouths and noses to avoid breathing in much of the dust that can accumulate inside the vines. As the day started, Gary was getting a crash course from other workers who have picked grapes here for decades. They were pointing out what should be picked, how they should be picked and what would remain on the vine for future picking. The grapes were placed into large white containers and taken to another worker to sort them and place them in plastic bags to be boxed. Gary was handed some pruning scissors and told to get to work. Workers here take this job very seriously. They get paid 8 dollars an hour before taxes and about 11 cents per box packed. They work in teams of 3 and Gary is teamed up with a husband and wife who have been working in vines like these for over 30 years. The workers laugh and make jokes at Gary's expense, as it's obvious he's a novice at doing this work. They take the time to inspect all of Gary's work to make sure the company's quality control supervisor who inspects all of the boxes packed for delivery rejects none of the grapes he picked. As the day presses on, it gets hotter and hotter. It's starting to become very uncomfortable, but you wouldn't know it listening to the workers laugh and sing while boxing up their fruit. As Gary is working with his team, I talk with many of the other workers who tell me they're happy to be working. They say they have to earn as much money as they can now, because there are several months when the grapes are not in harvest and they won't be able to work. I ask them why they come here to work and they speak of poor wages and conditions in Mexico. They say that while they only earn 8 dollars an hour here, they'll make that in an entire day working in the fields in Mexico. Many of them have children who were born in the United States. Some have gone to college and others are married and living productive lives here as U.S. citizens. 5 hours into the day the foreman calls for a lunch break. Gary appears out of the vines looking hungry and thirsty. 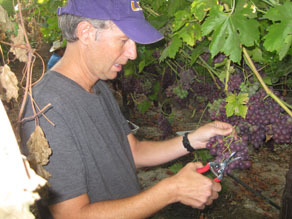 After we finish the 30-minute break, Gary heads back to the vines with the other workers, 3 hours of picking still ahead of them. One of the workers says this is the hardest part of the day, the sun is getting hotter and the shade doesn't do much for the heat. The temperature is now 102 degrees. Gary is starting to catch on to the work, but admits the work is not only physically exhausting; it's also tedious and monotonous. 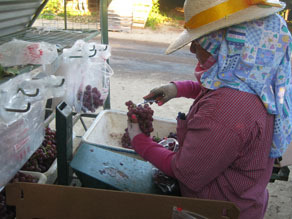 As the day draws to a close, a large truck comes through the work area and starts picking up the boxed grapes. It's the end of a long tiring day and while many workers will be back here tomorrow, none of us could imagine doing this every day. If Americans knew the length, height, depth and breadth of sacrifice that these immigrants made and make in order to do the difficult and often dangerous jobs that they do perhaps the Americans would not be spending a fortune to chase these immigrants out; they would be ON THEIR KNEES THANKING THEM. If Americans would work even half as hard as the immigrants, then this would truly be a strong country. I love this article, great job! What is needed is a working permit, this people break their back doing jobs that honestly, nobody including me would do. I am a naturalized USA citizen and my job is hard, but I would not be able to do what they do. People complain about them, but the reality is that no USA Citizen (american) would take such a job. I work in a nursing home and I don't see but minorities doing this type of jobs. Cleaning poop, wet diapers, giving showers, making beds, and feeding them...and callind the families to tell them, they just passed away...who would do such a dirty job...the immigrants/minorities. So lets stop with this anti immigrant thing and lets find a solution that is fair for everyone! and I must say, this is the first time I've seen an LSU hat on CNN!! As a 73 grad just wanted to say GEAUX TIGAS to Gary !!! Are none of them Americans, Eric? The article does not provide that information. According to the contractor they are "Latinos". Everyone, including CNN, uses ethnic stereotypes to characterize these workers as illegal aliens. Apparently ALL Latinos are illegal aliens, according to Tuchman, Cooper and Estrada(?). And if the farmer doubled his wages, how many pennies would that add to the cost of a pound of grapes? One? Five? To everyone who thinks that people would actually do the work if it paid, more, there are factors you are not considering. 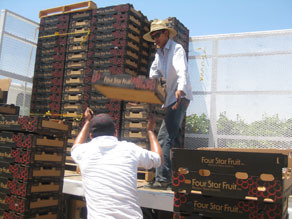 First, jobs like that are back breaking work in the hot searing sun of my native San Joaquin Valley. Most vineyard farms are family run and the farmers really cannot afford to pay more than they pay. They are struggling just to survive. You have to work very fast to really make any money, which means you have to know what you are doing. Most workers are paid by the piece, and not the hour. They can make more than $45 a day, but again, they have to work rapidly. Farmers do not have time to train younger people (read Americans). Most people in America are not country people, i.e. they know very little to nothing about farming. They are oppressed workers and don't know it. And while you are at it, Gary and Ismael, consider the racist attitude demonstrated by the original headline – work Americans won't do. The contractor said the workers were all "Latino", not Mexican. But the authors immediately leap to the conclusion that "Latino" implies "non-American". When half of Juarez leaves because of the violence, when middle class Mexicans rent apartments on this side of the border and send their kids to U.S. schools, when signs are posted in the Arizona desert warning travelers not to stop on major U.S. highways because of marauding bands of armed coyotes bringing illegals and drugs across the border, the issue of poor illegals doing work Americans won't do is a specious argument. The U.S./Mexico border is officially the most violent place on the planet today. The real story is not about illegal grape pickers–who the United Farm Workers demonstrated AGAINST when they were used for scab labor to break up the union–but is instead about refugees fleeing a war zone. Notice Arizona passed an open gun carry law first. It's getting ugly down here folks. Put down the racist card and open your eyes. How can the average American that lives in California afford to pay his taxes, rent, car insurance, fuel, etc. on the wages that these day labors earn? That's why they don't apply for these jobs. Could the reporter of this piece live on these wages? Also, the highway jobs, construction jobs, its the same thing, the average American can't provide the basics for their families on these wages. Thank you for this article. It remind us that our food industry depends immensely from their labor which goes heartbreakingly unappreciated. Agree with Ashlee on doing an in-depth investigation and how it would affect our economy if we no longer counted with their labor/contribution. They lost me with the first sentence. Delano isn't in the California desert. While there is some truth here, it is none-the less, yellow journalism. Obviously agenda driven. So tell me, who picks the grapes in France and the rest of Europe, if this is work that no one other than Mexican immigrants will do? Maybe no Americans would do the job...THAT IS NOT THE POINT.There are thousands of filipinos that would do the job as well and would do it LEGALLY. (The Philippines currently have large numbers that fly to Australia for crop harvesting/farm jobs) I am reasonably sure that there are citizens from other parts of the world that would take advantage of the opportunity ...if the fields were not saturated with illegal mexicans. by allowing these jobs to be occupied primarily by Mexicans. I worked several years picking strawberries in the field, Yes its hard the first couple of days, but your body gets used to it and then your on cruise control. By the end of the summer I was keeping up with the vets. I was only 13 years old but it was the only way to earn cash. If there were no jobs available and I had to feed my family. I would take the jobs, work is work and someone has to put food on the table. I am white. Although I am not a field hand. My grandparents picked the fields and my father picked when he was young. I agree with a previous poster. Basic supply and demand, the market will provide, just might have to pay more. People from all over the world work really hard to get here legally. I am married to a Cambodian woman who did everything they asked her to do and gained her American citizenship, long before I met and married her. People who work hard to get their citizenship's or work visas and legally got here are the true heroes of this debate. Bottom line is illegal is illegal, doesn't matter where your from. Seems people want to paint you a racist if you don't support illegal immigration. ??? So if Americans supposedly aren't willing to do these jobs then lets see some of your statistics on Farms across the country that aren't so close to the Mexican Border. I would love to see the 2010 Census for Delano, California. Of course if a town is full of a certain culture(I hate the word race) that is what you will see as far as jobs go. Love this story the comments are fantastic not like Yahoo's. Just want to clarify that I've been turned away from three farming jobs already because the position was filled by "someone else", even digging horse manure is a difficult job to get. I want anything, even the jobs some suit wearing, couch slobbering, princesses wouldn't. I hate being grouped with those people, just give me a damn job already, America. As a person who worked on a farm in the midwest growing up, these jobs are very dirty and sweaty. where are you going to find a ready source of labor for this kind of employment? Let's find common sense solutions that enables migrant labor to be here legally, without the fear of deportation, and giving these people a path to resident status and eventual citizenship. How about giving these people the respect and dignity for the services they provide in these farm fields across America, or the many roofing and construction workers that are here dealing with the heat to make a decent living in comparison to the lives they had south of the Rio Grande. How could I look at my daughter-in-law and tell her to go back to Mexico, taking my grandson with her? Let us have common sense legislative solutions. Other countries have guest worker programs, do we have them, or are we just playing political football for someone's political agenda? You are correct in saying "No American's want these jobs.". How about saying "No educated American's want these jobs." That is why some of their children went on to college. They too don't want to do this back-breaking job. This should be a lesson for all. Get an education and you won't have to pick grapes your whole life. Please teach your children this message. Even Obama stated on "THE VIEW" that education is the key for people and this country to advance! You missed a great opportunity to inform your viewers of WHY these people are picking grapes for a living. More CNN propaganda; More pandering to the left; Just another lame attempt to lure hispanic viewers because CNN ratings stink. AMERICANS WILL DO ANY JOB. When I was a younger, I cut grass, shoveled snow, washed dishes, etc The guy I hired to cut my grass when I was on vacation recently was a retired Air Force guy who started his own landscaping business. He was cheaper than the Mexican and Black landscaper. CNN patheticically sells stories to the ignorant. That's why they lost viewers to FOX. An unsecure border is not worth cheap grapes any day. 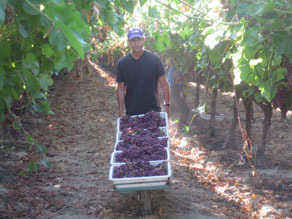 I'd pay 10 times the current price of grapes rather than have these free loaders come across our borders in the middle of the night to steal jobs that Americans WILL do. Deport them all ASAP and that includes VISA overstayers; not just Mexicans. Seems the censors at CNN have again decided in the search for truth and comments from as wide an audience as possible, have left my stories out (comments out) What's new? If one has hard facts and looks between the lines of a story. One can and often finds that way back when there were folks that did work very similar to the work this news story is reporting. See, not everyone is in there 20's or 30's even 40's Anderson's beat reports. Sorry I am too lazy to scroll up to insert your names as the author of the above story. There are folks that grew up when you had to work and do jobs that were there for the taking. No everyone has the opportunity to write a story like the one upon and get paid handsomely for it. Still I prefer CNN when Mr. TED TURNER was running the daily operations. It was then a fine news network with factual reporting of news of the day. Not the bouquet news that Americans are being fed daily by so many news reporting agencies. If we do not have Americans to do these jobs, they would not necessarily need to be filed with illegal and undocumented workers. There is a legal way to get work even as a seasonal agricultural worker. Apply for the necessary visa and pay the required fee, have the labor department approve the wages in order to prevent the employment of dirt cheap laborer, this way they will have to pay social security, Medicare and taxes like everybody else. Same as higher qualified specialty worker and scientists, who are working legal in the US on various types of visas. Too bad the illegal workers are only providing an advantage to the company hiring them for cheap. They are a burden for the government with the medical services provided to them as well as the education for all there kids. The losses the government has to suffer from the missed fees and taxes will never being compensated true the enormous earnings the company's are going to archive, since they can write off there winnings before they have to pay taxes. I have been unemployed and steadily looking for work for a year now, trust me, American born citizen here that can't get a job because I'm A: overqualified B: A male or C: I'm young. I have all the talent in the world and I'm really starting to get t'd off. I would like to see CNN go more in depth on this issue, besides the work immigrants do in the fields, they are also working in the hotel industry, construction, restaurants, housekeepers, gardeners, and as nannies. Please report more on the money taken out of their paychecks for taxes and social security, money they will never use for their own retirement, that money is actually supporting retirement checks for the rest of us, so the more that are deported the less money we will have. Please stop the hate! American workers would do this job but they won't do it for the meager wages that a being paid. If companies paid a decent wage they wouldn't have to resort to hiring illegals. Great Story. This is the true depiction of how the day laborers work under extreme conditions and low pay. And yes its true, They do the work no-one else wants to do. It's not that Legal Citizens in the United States will not do this kind of work (I used to work the fields, and I am a caucasian that grew up in the suburbs) it's that the farmers want to get away with paying substandard wages to legal workers while they reap millions in profits. If farmers would forced to pay what these jobs are really earning, which is estimated at $15 TO $20 an hour with full-benefits, the balance would be accurate, and it would most certainly attract all manner of legalized nationality workers to the fields. We do not apply for these jobs because they pay $8.00 an hour, poverty wages at best! As a computer analyst, I would beat my rear-end in those fields today if they paid the proper wage and I would take my rightful job from illegal workers that are actually enabling employers to underpay and create a substandard wage expectation. I lived in Mexico for 6 years and returned to the U.S. in February. I agree with what most here have said...send the field workers away and pay $10 for a head of lettuce. We have a very symbiotic relationship with the Mexican workers, we need them and they need us. It's been that way for over a century and it is not likely to change. I think all the yelling and screaming is utterly stupid. And yes, I am well aware of what is happening at the border...that's a different story entirely. News flash! 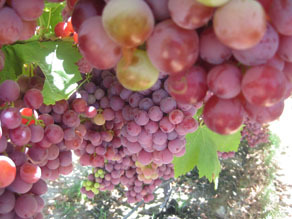 Many grape vineyards are harvested mechanically now. This is either an old vineyard, or they are harvesting a higher-end variety of grape that warrants multiple harvests. Yes, it is tough work, and legal residents do avoid the work, for minimum wage. If there was no illegal workers to do the work, the wages would be higher. For $14 hour, and overtime rules that apply in EVERY OTHER INDUSTRY, teenagers, college students, and unemployed family men like me, trying to put food on the table for our families would do it too. I lived in California's central vallet for several years, and many farmers there are converting their fields from row crops to orchards(mostly almonds) and vineyards because these can be easily harvested mechanically. I think they see the writing on the wall. Only the astronomical price of corn has kept some of the fields in row crops. Farmers will adjust to the rising labor prices by switching crops. Farmers were more effected by the hike in fuel prices a few years ago than doubling the wages would. Fuel and water are a farmers highest cost items, not labor he has to pay for a few days only. I'm sorry to say, Anderson kind of missed the ball on this. There are no jobs that 'Americans' won't do. However, there are wages that 'Americans' will not work for. I guess we all like cheap stuff. ...and stop throwing the "We are all immigrants" card. I'm not an immigrant. I was born and raised here, that makes me as native as any Native American. this is a bull story. my husband, retired navy, has been applying to these labor jobs and still hasnt gotten work. a lot of the jobs in the fields you cant even find a way to apply for, so they dont exactly make it easy, unless of course you know which corner they pick up their day workers at!!! !